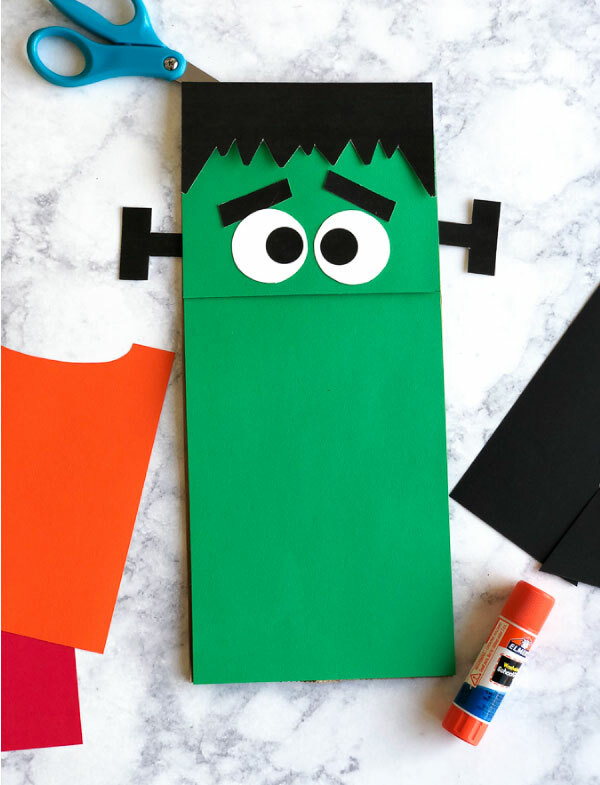 Inside: Have fun this Halloween making this cool Frankenstein craft for kids made out of brown paper bags and colored paper. 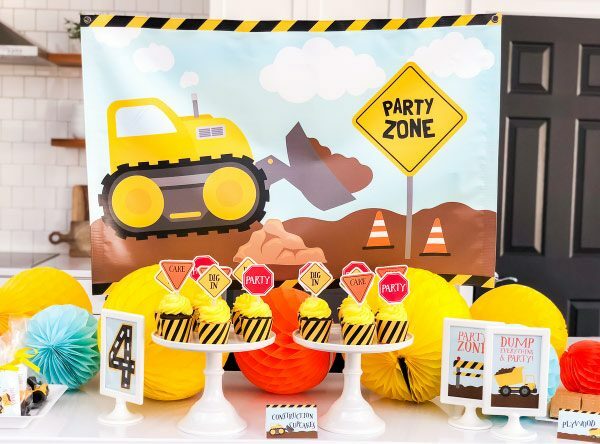 We’re back again sharing another fun Halloween idea for kids! 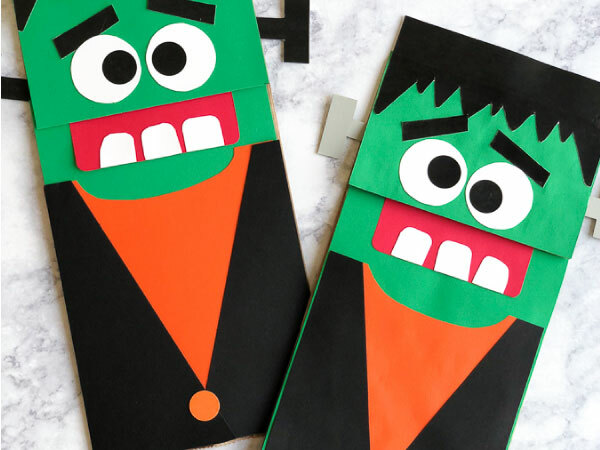 Today we’re sharing a fun and simple Frankenstein paper bag puppet. 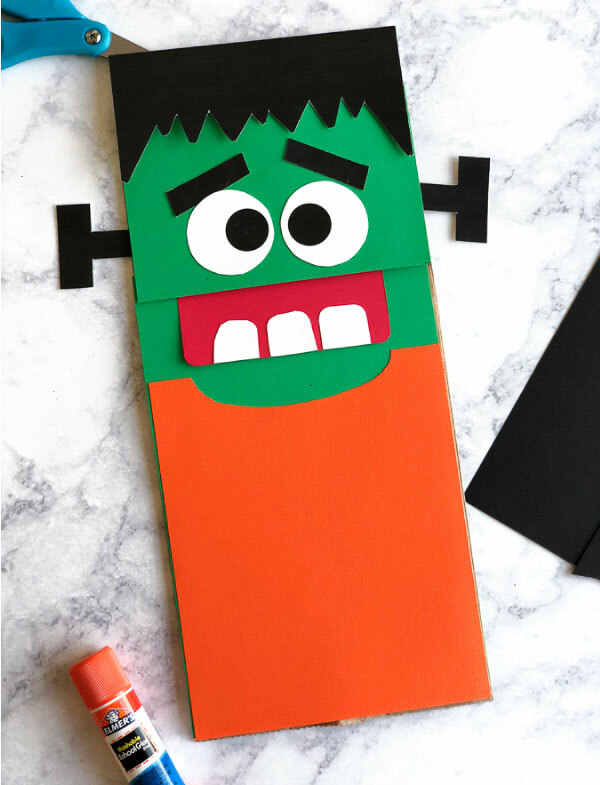 Read on below to see how to make this easy craft at home with your kids and celebrate the Halloween season! 1. 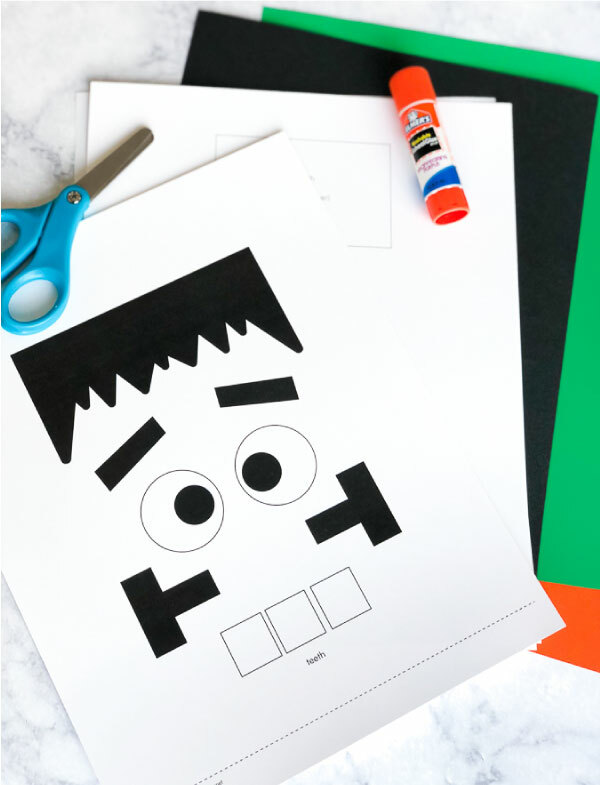 Download and print out the Frankenstein template on thick, white cardstock. Cut out all the pieces. 2. Measure the width and height of the top portion of your brown paper bag and cut out a rectangle that size from the green paper. 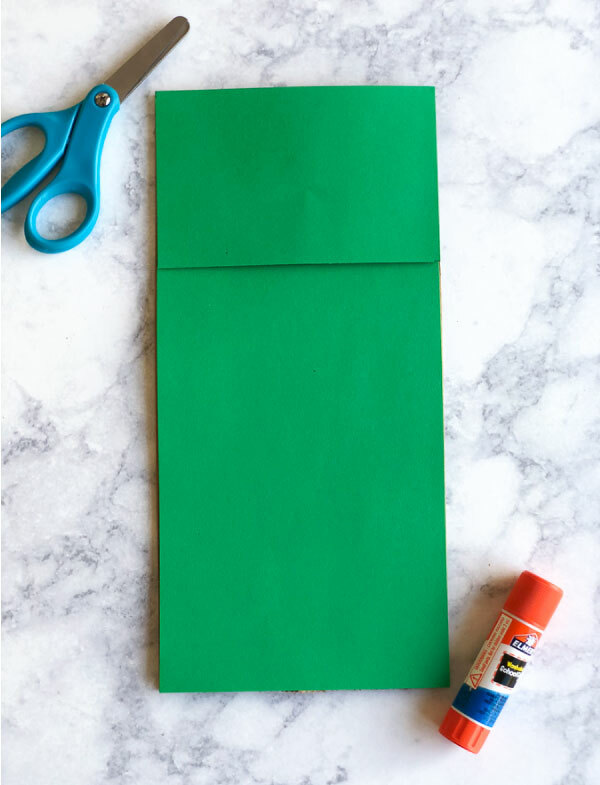 Glue the green rectangle onto the paper bag. 3. Measure the width and height of the remaining part of the brown paper bag and cut out a rectangle that size from the green paper. Glue this rectangle onto the bottom section of the bag. 4. 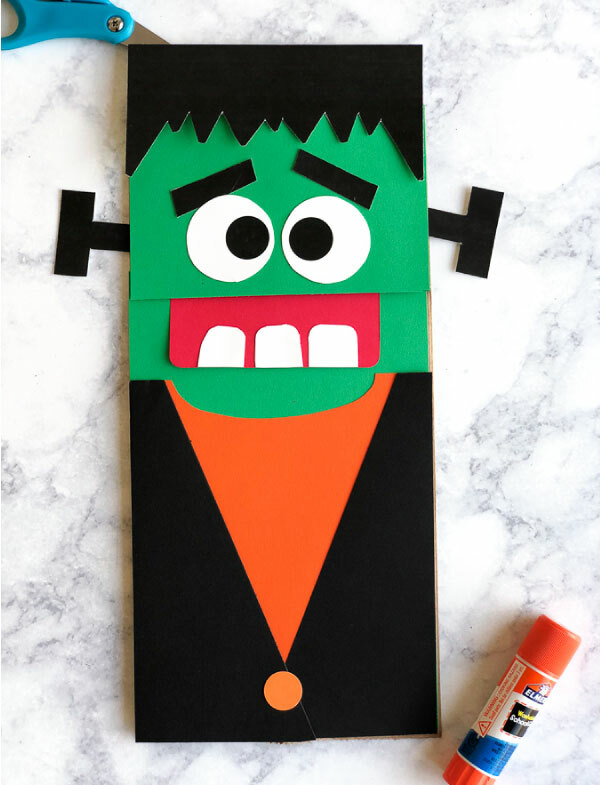 Cut out Frankenstein’s face features including the hair, eyebrows, eyes, teeth, and bolts. Round the corners of the teeth if you want. 5. Glue the hair onto the top of the paper bag, with about a 1″ overhang on the top (so there is enough room for the rest of the face). 6. Glue the eyebrows and eyes onto the green colored paper. Glue the bolts underneath the top flap of the paper bag. 7. Trace the mouth template onto the red paper and cut out. 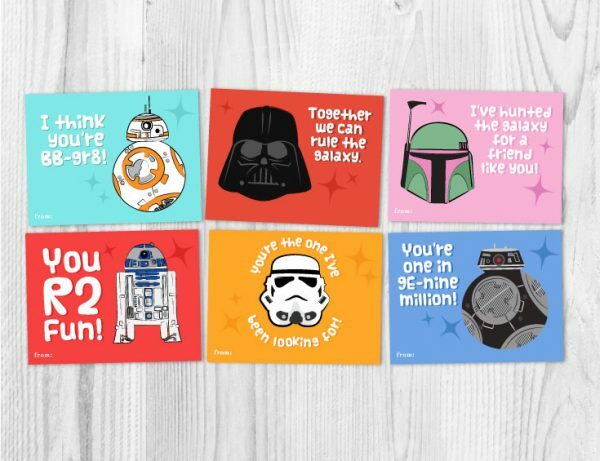 Round the corners, if you want. Glue the teeth onto the bottom of the mouth. 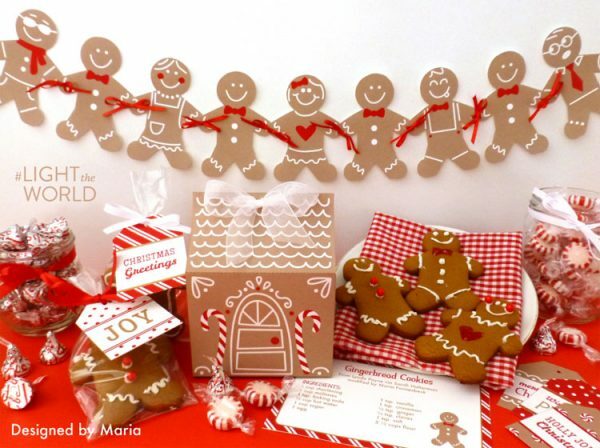 Cut off any of the excess teeth from the red paper. 8. Trace the shirt and jacket template onto the orange and black paper. Cut out the colored paper and glue onto the bottom of the brown bag. 9. Cut a small circle or use a circle punch (I used a .5″ punch) to make one orange circle. Glue onto the middle of the jacket pieces. Once everything is dry, you’re all set! 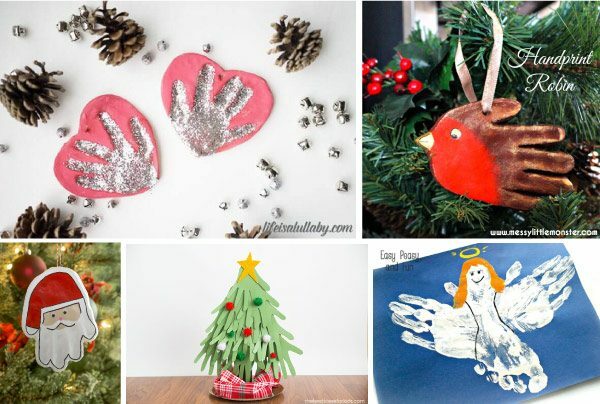 Let your kids have these for open-ended play time or have them practice telling spooky Halloween stories with their new puppet. 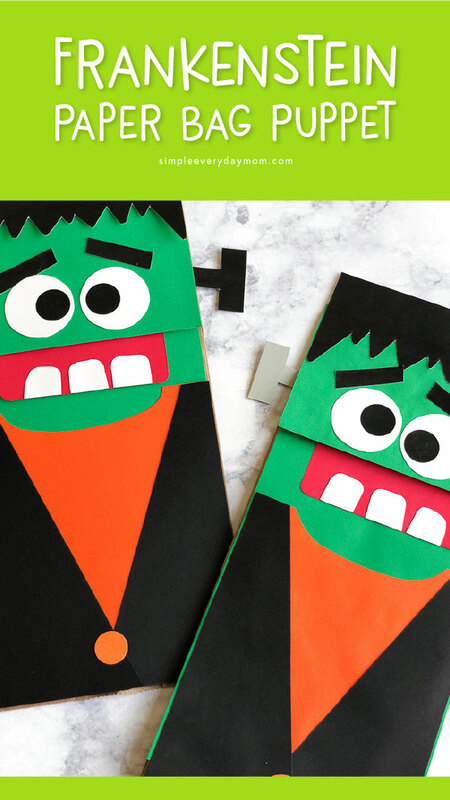 Don’t forget to download your free Frankenstein template by entering your email in the form at the bottom of the post.